Carol grew up around Muswell Hill, North London and attended William Grimshaw school which was also where Ray, Dave Davies and Pete Quaif of the Kinks were pupils. She was also a great fan of the Glastonbury festival alongside Jo, her daughter and they often went to the festival as workers cleaning up the site and helping with the recycling of the mountains of rubbish generated at such events. This rendition of Days sung by Ray Davies and the Muswell Hill Choral Group will forever remind us of her. In the last few months of her life we were visiting as often as we could and whenever she was well enough to accept visitors. On one occasion we sat through a rerun of Ray Davies's set at Glastonbury 2010 with her - we will not forget and thank you Carol for the days. 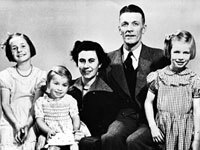 The Worts family had four children, Ruth is the eldest, then Carol eighteen months later, followed by Jane four years after that and finally Richard four years after Jane. 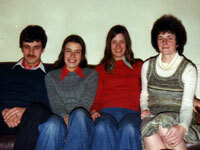 In this early picture Ruth is on the far left, Jane is sitting on her mum's knee and Carol is on the far right. Richard was yet to arrive on the scene. Carol was always closest to Ruth because they had four years of bonding before Jane was born and eight years before Richard came into the family. Despite their closeness they were very different characters with Ruth finding her way into adulthood ahead of Carol who tended to be more focussed on her school work and less on boys. Carol became head girl of her school and went on to marry her Physics teacher, Frank. 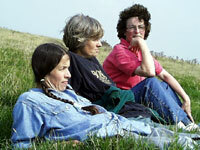 Into their late twenties and early thirties Ruth (far right) took on a style of her own with Carol and Jane seemingly sharing a fashion sense. Richard as the only boy in the family had to plough his own furrow. 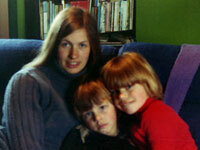 After qualifying as a teacher she taught for a short while before becoming a mother to Jo and two years later to Kit. They spent many years in Juba whilst Frank was lecturing at Juba University. Because Ruth lived in Australia it was a rare event for the girls of the family to get together. 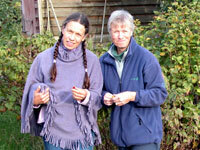 In September 1998 we booked a holiday in Dorset and invited Ruth and Carol to stay with us for a few days. It was a great holiday, when the girls could walk, talk and reminisce. Steve did not seem to mind having the opportunity to be fussed over by us all. This shot epitomises those few days, three sisters at one with each other - Jane the youngest, Carol in the middle and Ruth. 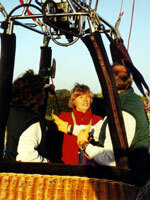 Hot Air Ballooning was our hobby for nearly twenty years and thankfully we were able to get Carol and Ruth flown together. It is an activity which is very weather dependant but it came just right that they were both staying with us so we made an early start and made a landing in a very wet grass field in the south of the county. Carol loved every moment and as with all things in life threw herself into the activity with gusto. She helped to get the balloon set up and inflated and was equally enthusiastic with getting everything packed away after landing despite the water logged ground. Carol never stood back, she always wanted to be involved. One of Carol's great passions was her allotments. After her retirement she spent many hours down on one or other of her allotments cultivating, sowing and reaping the labours of her organic vegetable plots. 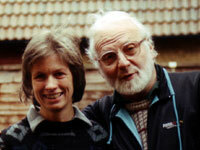 Carol & Frank were married for 45 years so the loss of either partner is bound to have a significant impact. 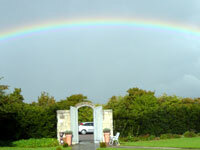 At the end of the funeral afternoon as we were preparing to leave the rain stopped and there was this magnificent bright rainbow. This was a most fitting end to the celebration of someone's life and we stood and admired it for several minutes, it was almost as if Carol was saying goodbye and thanking her family for such a superb send off.